What? Why? Membership Categories Member Savings FAQ Join Now! what their membership fees cost based on their ability to pay. 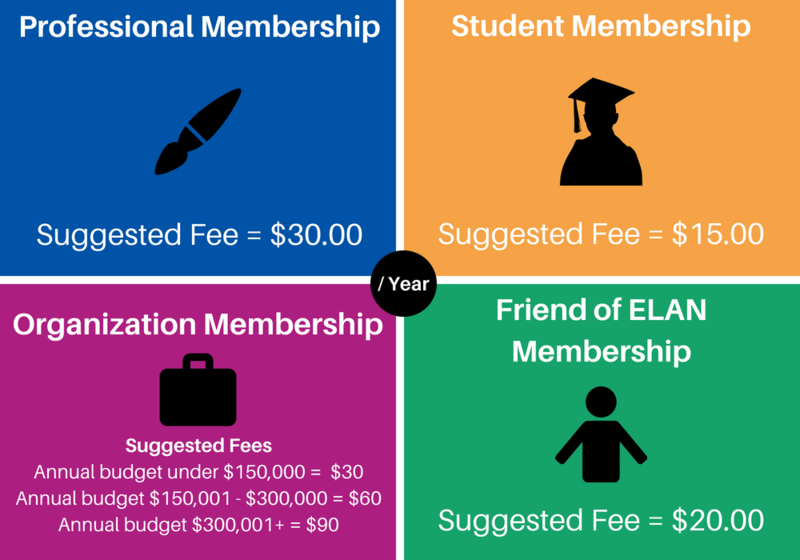 Your annual membership fees help finance ELAN membership services. With your contribution, ELAN is able to provide free or low cost resources and services to our members, advocate for Quebec artists, develop projects, and host free events where artists and arts lovers connect. That said, our suggested membership fees are not intended to apply pressure. We strongly encourage members to choose the amount that they are most comfortable paying. An astounding majority of our members voted in favour of ELAN’s Pay-What-You-Can model at our 2017 Annual General Meeting. The adoption of a Pay-What-You-Can model aligns with our ongoing commitment to make ELAN membership more inclusive and accessible. In doing so, we believe that our work will better reflect the interests and complex realities of Quebec’s diverse population of artists. Quebec artists are talented and resourceful. They represent a variety of experiences, expressions, and linguistic and cultural identities. We praise their passion to create art, and we recognize their important contribution to Quebec’s cultural landscape. With a Pay-What-You-Can pricing model, we hope to make it a little easier for all artists to join the ELAN community. No matter what you’re able to give, your contribution helps make our resources and services accessible to everyone. For every online payment, ELAN pays a 2.9% + 30 cents fee to our payment processor. To cover this cost as well as administrative costs for processing memberships, we ask members to consider a $1.00 addition to their contribution. Click here for a full list of member deals and discounts! Pay-What-You-Can is a pricing model most popularly used by non-profits (but have also been used by for-profit businesses). Pay-What-You- Can means that customers choose how much they will pay for a good or service. How did ELAN decide to move to a Pay-What-You-Can model? ELAN put the question to a vote at the 2017 Annual General Meeting: Should ELAN’s membership fees become Pay-What-You-Can? An overwhelming number of our members voted Yes! How do I know if I am eligible for a Professional Membership? ELAN members include emerging artists, mid-career artists, and established artists from a multitude of disciplines, background, and regions of Quebec. To learn more about eligibility, click here. If you are not an artist or cultural worker, or if you reside outside Quebec, you’re invited to join as a Friend. If you have any more questions regarding eligibility, please email us at membership@quebec-elan.org. Can I pay my membership fee with cash or cheque in person? You are welcome to come by our office to make an in-person payment, however, please email membership at: membership@quebec-elan.org or call the office at 514-935-3312 to schedule an appointment ahead of time. What payment options does ELAN accept? If I pay less than the suggested fee, will I have access to fewer resources and services? No. All members get equal access to services and resources. If I pay more than the suggested fee, will I have access to more resources and services? I am unable to pay a fee at the moment. Can I still become an ELAN member? If you are unable to pay a fee you are still very much welcome to join ELAN’s community of members!